Just got back to see my newly painted kitchen. It looks absolutely amazing! It is a completely new room and we could tell anybody we had a new kitchen built in. We tracked Nathan down through Handmade Kitchens having spent a lot of money and deciding we needed a specialist fitter. Thank goodness we did. Nathan is a self sufficient pot of gold; punctual, professional, skilled and a great problem solver (“what problem?” was his usual response). He has a creative eye and is meticulous in fine tuning detail. He really is fantastic at his job and hugely experienced. To cap it all he is a good bloke who fits into household routines. A pain free experience for kitchen renovation virgins. We are delighted with what a great job Vanessa did on painting our kitchen units. As our project progressed we kept her up to date on progress, which was slower than we originally anticipated. She remained flexible with scheduling through this process. She was a pleasure to work with as well as very clean and tidy. The workmanship is excellent and I’m very pleased to say the finish is superior to that of the units in the kitchen showroom we bought from. Once she was finished we still had a couple of trades to come through and complete their jobs. As part of the deal Vanessa came back when they were all done to touch up, giving us a kitchen we are really proud of. I would be very happy to recommend her. After our first meeting with Nathan we had a feeling we were onto something good in asking him and Vanessa to install our kitchen and we weren’t wrong. We had a huge piece of oak worktop to shape and place in a particular position in our kitchen and Nathan took time in giving us much needed advice to decide the correct position and measurements. 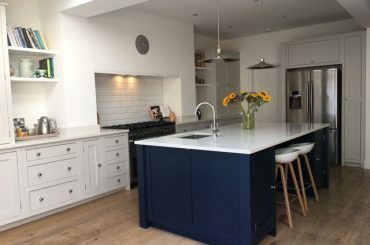 Vanessa did a brilliant job painting the cupboards the glorious deep blue that we had chosen to contrast the white Quartz worktops and the two of them work together as a diligent, fun team. Nathan worked well with our electrician in securing the floating oak wall shelves with recessed LED strips and the results were very striking. We would highly recommend Nathan and Vanessa to anyone who wants a high quality kitchen. They pay great attention to detail and listen and advise where required. Thank you very much for completing ours for us – we are thrilled. We are so pleased with the quality of the finished kitchen, everyone who views it cannot believe that the cupboards have been hand painted and the difference it has made to the overall appearance. The attention to detail Nathan took in installing the new worktops, sink and tap was amazing. Vanessa and Nathan were very professional throughout, friendly and importantly kept us informed and arrived on schedule. We would not hesitate in recommending NV Kitchens. We were so impressed with the quality of your work. Our kitchen is stunning, everything we hoped for. Everyone who has seen it has been really impressed too, ‘wow’ seems to be the most popular comment! You were so professional, but more importantly helpful and friendly, accommodating when my build ran behind schedule and patient with advice on paint colours when I couldn’t make up my mind!. We wouldn’t hesitate to recommend you and hope we get to work with you again very soon. We can honestly say that the results of our much admired kitchen refurb have far exceeded our expectations. Your friendly positive approach gave us confidence from the outset and we were more than happy to “leave you to it” while we went on holiday! Great advice, great attention to detail, a great result from a great team. Thank you Nathan and Vanessa – we will not hesitate to recommend you to everyone. We’d like to thank you for giving us such a beautiful dream kitchen. It was a pleasure having you around due to your friendly and professional approach. Even though our building project didn’t go exactly to schedule, you were flexible with your dates to ensure you fitted and painted our cabinets at the most convenient time. Your workmanship is brilliant and we wouldn’t hesitate to recommend you. We can’t thank you enough. I just wanted to let you know how pleased I am with my kitchen. There is no second chance at first impressions and I must say that you exceeded my expectations. So many of my friends and family thought I had purchased new kitchen cabinets and are quite astounded that I had them professionally repainted. The cost for repainting the old brown cabinets was very reasonable and within my budget. I was very impressed with your work ethic, professional yet friendly I found that Nathan and yourself were very industrious and you kept me informed of the process in transforming my kitchen. Your workmanship was second to none and I certainly appreciated your advice throughout. Although doors had to be removed and taken away it was with minimal disruption. I felt very much at ease leaving you in my home to carry out work whilst I went shopping. A very happy customer who will not hesitate in recommending your business to others. Thank you very much and best wishes to you both. On behalf of Jackie and myself, I would like to thank you and Nathan for carrying out a superb refresh of our kitchen and utility room units. Your work has been first class and from our initial enquiry through to completion you have both worked extremely hard and professionally at giving us just what we wanted. Jackie and I are extremely grateful and would have no problem in recommending your services to whoever may wish to contact us. Please feel free to use the images sent of the units “before and after” the refurb. Nathan must be a relation of Doctor Who as he seems to have delivered an increase in both storage and floor space within the confines of the existing kitchen simply by replacing one run of fitted units! Vanessa’s painting skills have transformed the remaining tired old cupboards and cabinets and given them a new lease of life. Nathan and Vanessa have been fantastic throughout the kitchen fitting process, providing much appreciated guidance about paint colours, accessories and such like. Their knowledge of Christchurch Kitchens helped hugely. The kitchen is beautifully fitted and painted, within budget and we look forward to enjoying it for many years to come! We thoroughly recommend their services. Vanessa and Nathan, we are delighted with our “new” kitchen. We cannot believe the transformation brought about by just painting the units. It’s had lots of admiring comments and your work was complemented by another professional decorator. Thank you too for being such a pleasure to do business with. It’s a slightly terrifying thought to renovate, or more importantly, be without a kitchen with two very small children. I am delighted to say that our new kitchen endeavour couldn’t have been further from our expectations. We had a functional kitchen within a couple of days and everything else slotted into place almost seamlessly. Nathan was absolutely perfect! A pleasure to have on-site, very easy to work with and extremely accommodating of my somewhat varied requests. His “I’ll figure it out” attitude was great. I just wanted to thank you again for all your hard work on our kitchen last week – it is even more beautiful than I imagined and the comments we’ve had are amazing. Absolutely in love! We are really pleased with the work you have done on our kitchen, it looks lovely and so much lighter – thank you! I have picked a deep pink paint for the walls to go with the units and the finished effect looks quite stunning. Thanks again for all your hard work. When choosing a company from the Internet it is always a gamble. But choosing Vanessa and Nathan to paint our kitchen was a winner. Vanessa was a joy to talk to and made excellent suggestions, which we followed up. The quality of the work was of the highest standard and we are delighted with the final result and are receiving many good comments from our friends – thank you for doing a super job. In addition to this, the estimate for the work was reasonable and the price was good for the work produced. Thank you so much to Vanessa and Nathan for doing such a super job with our kitchen. We had recently had an extension done, which made the kitchen look more dated than ever ( it was approx 16 years old and the cream finish had gone off colour) but we didn’t want the hassle or cost of a new kitchen. A friend suggested having our cupboards painted and we found NV Kitchens via Google. We liked the sound of the family run business and could see their work was of a high standard …. and we were delighted with the results. In just one week our kitchen was transformed, painted a soft duck-egg colour and looking like it was brand new. On top of that, Vanessa and Nathan were thoroughly professional and tidied up after themselves – it couldn’t have been easier! Just a quick note to say thank you for all your work painting our kitchen. I’ve got to say we are so happy with your professionalism, quality of work and flexibility. Overall it’s really nice to do work with really pleasant, honest and reliable people. I would be more than happy to recommend you to anyone that ever needed your services. Really a very good job and I realise it’s not great when you find out a designer has employed you! You fulfilled all our pedantic wishes and more with your sound advice and expertise. I don’t recollect any conversations beginning with “why have you done it that way” so many thanks, it was a pleasure and look forward to working with you again. Just to say thank you for the amazing job you have done on our kitchen. It’s everything we dreamed of! I knew Nathan was the right man for the job when he hugged the woodwork in my hallway! Nathan and Vanessa were a joy to have in my home. They were both friendly, helpful and knowledgeable and worked well with the other craftsmen to create my kitchen. My kitchen has been much admired by both friends and family – thank you. I am writing to thank you so much for hand painting our new kitchen. We were initially very pleased with the advice regarding different paints and choosing a colour, your flexibility re. start dates, plus the quote was very competitive and exact. 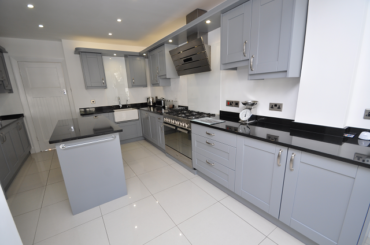 I felt very comfortable giving you our key when I had to go away at very short notice and what a wonderful surprise to come home to a kitchen painted to the highest standard in a colour we all love. Please thank Nathan too for all the technical help and support and his advice clearly gleaned from fitting a number of kitchens similar to ours. I would highly recommend your work plus your very friendly and approachable manner. Thank you once again. We are delighted with the end result of Nathan and Vanessa’s work painting and installing our kitchen. We had building work going on during the duration and their adaptable “can do” approach and attention to detail made all the difference. Work was carried out at the agreed time and to budget and no surprises! Highly recommend you to all as someone who is always quick to respond with a calm and helpful approach. Loads of really useful hints and tips and a pleasure to have working in your home. Wendy, the lady you went to see the other day, came by to see me this afternoon bringing a friend with her. Wendy said she is most impressed with you and wanted to show her friend the work you have done on my kitchen. She will probably be contacting you as she, too, needs her kitchen renovating. Vanessa gave a truly friendly and excellent all round service from the first contact we made right up until our kitchen was painted. The turnaround was quick and efficient, with minimal disruption and the finish is excellent; we are thrilled with the colour! We would highly recommend Vanessa to anyone who is contemplating having a painted finish on their kitchen units; she was a pleasure to have working in our home. A quick word to say thank you so much for your work painting our kitchen. Your attention to detail was superb and your ‘service’ in terms of clear communication, follow up and responsiveness was excellent (a rare experience in this building project we have undertaken!). So thank you both, you were a pleasure to have around and we won’t hesitate to recommend you. I wouldn’t hesitate to recommend Nessa and Nathan. I’ve just read the testimonials from other clients and I could have written all of them! I too had set backs and problems with my builders and Nessa and Nathan were like a breath of professional air. Their quote was very reasonable and they were so helpful and flexible when it came to fitting around the ever changing timings. They really go the extra mile and it’s such an added bonus that they’re lovely people to boot. My only regret is that I didn’t use them for the whole house! Nathan and Vanessa were recommended to us by some friends and everything they related was true. They were happy to work within our plans for refurbishment, rather than a complete new kitchen. Nathan has a wonderful ‘can do’ attitude, which together with his skill and Vanessa’s planning the diary to fit in with other commitments, resulted in a good job being done. It was a pleasure to have them around and watch the kitchen take shape. l am happy to recommend them. Nathan and Vanessa were recommended to us by a friend, to fit our kitchen. Our project fell quite a long way behind schedule and the date for fitting the kitchen moved several times. During this rather stressful time, Nathan and Vanessa were extremely flexible, understanding, had very useful advice and were a calming influence amongst the chaos that was brewing! The quality of their work is fantastic and you couldn’t ask for more personable, friendly, relaxed people to come into your home. I wouldn’t hesitate to recommend Nathan & Vanessa to anyone. Recommendation is the way to go and that’s exactly what happened to us with Nathan and Nessa. Everything felt covered and they immediately instilled us with faith in their work and as people. They were easy to welcome into our home due to their warm and friendly natures. Nathan talked us through the process so we always knew what stage we were at and what was happening next. Their workmanship is second to none and you can tell that the end result is just as important to them as it is to you. Without a doubt a credible, trustworthy and dedicated team who we wouldn’t hesitate to recommend to others. We are writing to say how thrilled we are with our new, hand-painted kitchen, fitted and painted by Nathan, Ollie and Vanessa. They came when they said they would, charged us exactly the amount of their estimate (even though they did a few bits more as the job went along), they worked to very high standards and were a delight to have in our home while the work was progressing. We have no hesitation in recommending them to anyone contemplating having a new kitchen fitted and finished. Wishing them every success in the future. I was initially going to ask my builders to install and paint my new kitchen, but I was so pleased I used Nathan and Vanessa, who were recommended to me by a friend. They were thoroughly professional and made a stunning job. They also organised the granite templating and fitting for us through Granite Craft Direct, which saved us over £600 compared to our other quotes! 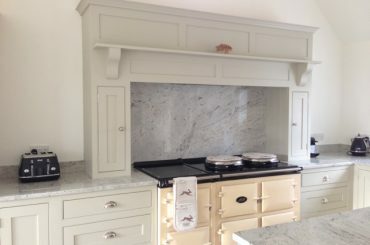 Nathan was happy to do extra work to finish off the kitchen, including making bespoke shelving and a stunning mantle. Nessa’s painting work is of a very high standard and I thought she’d spray painted, but she assured me it was all done by hand! Thank you for a great job. I just thought I’d send an e-mail to say how pleased we are with the final result. The fitting and painting of the kitchen by Nathan and Vanessa is a really super job – thanks! I was delighted with the service I received from Vanessa and Nathan. Upon my initial enquiry I received a warm and efficient response, with plenty of help and guidance. They were able to fit in around various builders, plumbers, etc and were always available to come round to ensure the big renovation we did ran smoothly. Not only did Vanessa do a great paint job after Nathan had fitted, but she helped with advice on paint colours and options of different types of paint in advance. Nathan fitted the bespoke kitchen units, topped with an Ikea worktop, perfectly. I felt I was able to be as fussy as I wanted, and that no request was too much. The combination of the professional fitting/painting and the cheerful/positive/friendly approach would make them hard to beat. I couldn’t have asked for a better result! Nathan installed the handmade kitchen and fitted a lovely wooden worktop from Norfolk Oak and Vanessa made a great job of painting the cupboards. They were prompt, efficient and a good team to have around – absolutely recommend them! Planning and fitting our kitchen with Nathan and Nessa was was a really enjoyable experience. They have so much experience and offered some really useful ideas through the process. Nathan totally ‘gets’ design and understood what we were looking for from the beginning. He is a true craftsman,with an eye for detail and wouldn’t stop until we were 100% happy. The finish and quality of their work is excellent and our concerns about the finish of a painted kitchen were unfounded. Nathan was also very flexible and worked really well with the various other trades and suppliers – which seems a small thing, but is actually so important to make things go smoothly! Nathan and Nessa’s experience meant they helped choose our paint/wall colours and create the look we were after. The end result is something we are really happy with and look forward to enjoying for many years to come – and when we’ve had enough and fancy a change, we’ll definitely be asking Nessa to re-paint! I am beyond pleased with my new kitchen. The quote was competitive, time-scale realistic and all trades people involved were punctual, tidy and respectful. Nathan offered advice from his experience, especially regarding the island we put in the kitchen, which is indispensable and I nearly didn’t have it! 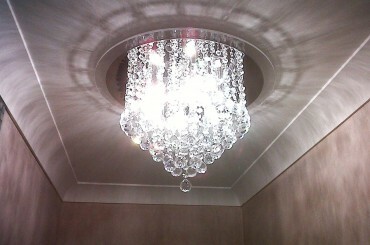 The building work carried out was good, I couldn’t fault the service and am thrilled with the end result, everyday. A dedicated team that are passionate about delivering what their clients what to achieve – they gave us that and more. Thank you so much for being part of making our dream home – would recommend you without hesitation to people that require a fantastic end result, we believe we now have one of the best kitchens in Farnham and that’s all down to you! We are delighted with the entire service Nathan and Vanessa provided. Throughout the makeover of our kitchen, they kept us fully informed, acted with the utmost professionalism and were completely trustworthy. Consequently, we have used Nathan and Vanessa for further re-modelling work and have already recommended them to friends. A great addition to the project team for the refurbishment of our cottage. Nathan and Vanessa were recommended to us by Handmade Kitchens Direct of Christchurch . We found NV Kitchens to be competitive and organised. They worked well with the building team so as to ensure there was a clear build programme and also with the supplier for the ordering of additional items we had overlooked. Works were completed on time to a high standard. They also attended site extremely promptly to deal with a minor snagging item 2 months after completion of the job.